Pretzels and I go way back. I can’t tell you how many times a bag of pretzels got me through a stressful situation. I remember having a bag of pretzels at my desk daily as I was starting my television anchoring career. Rush hour traffic? A bag of pretzels helped me munch away the tension. I was such a pretzel addict that when Rold Gold Pretzels changed their recipe from the regular size to a thinner version, I penned a letter to the president of the company begging him to reconsider. Now that’s an addiction gone too far. I’d gone off the deep end. Then, there’s the soft pretzel. (That’s a whole different story for another day.) Those are a much harder habit to break so I just quit trying. Instead, I decided to hunt for a great recipe because driving to the mall every few days for a soft pretzel was just not an option. I think I finally found a bite size bonanza! Make the dough. Place warm water in a small bowl. Add honey or sugar and stir. Sprinkle in yeast and let stand until foamy, about 5 minutes. In a large mixing bowl, combine 2 cups all purpose flour, 2 cups bread flour, melted butter and salt. Add yeast and knead, using a dough hook attachment. If dough is sticky add additional 1/2 cup of bread flour. Knead for 5 minutes, or until the dough forms a smooth ball. Place dough in a large bowl coated with butter. Cover with plastic wrap or towel and let rise until double in size, about one hour. When ready to bake, preheat oven to 420 degrees. Place dough onto a clean work surface. (Do not flour surface.) Cut dough into 6-8 sections and roll the dough and form long ropes. Using a knife cut the ropes into 1 and 1/2 inch pieces. Make the egg wash by mixing together water and egg yolk. Have pastry brush, slotted spoon, pretzel salt, kitchen scissors, and baking sheet ready. Bring 5 cups of water to boil. Add baking soda. (Do not skip the baking soda step. This is what gives the pretzel it's unique taste and appearance.) Put about 6-7 pieces of pretzel dough into the simmering solution and let cook for 30 seconds. Remove pieces with slotted spoon and place them on baking sheet. Continue with remaining dough. 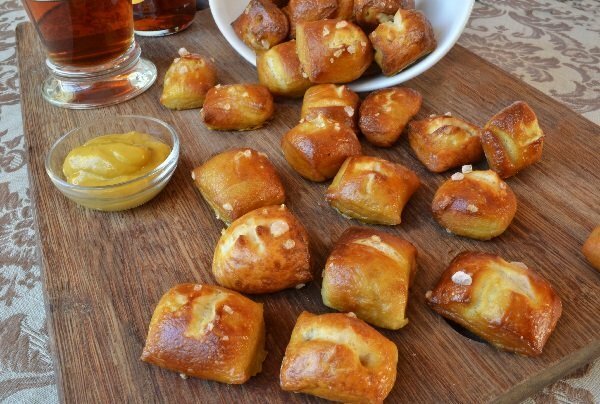 Brush each piece with egg wash, sprinkle with salt and using scissors cut a cross into the top of each pretzel piece. Gently transfer pieces onto a clean baking sheet lined with parchment paper. Bake at 420 degrees for 9-10 minutes or until golden brown.